Red River College Women’s Soccer is pleased to announce the commitment of Kendra Moen For the 2016 MCAC season. Kendra played her youth soccer in Rainy River, ON. Kendra is currently attending Rainy River High School where she is a multi-sport athlete on several varsity teams. Kendra was the soccer MVP in 2015. Kendra also competed in the 2014 North America Indigenous Games in Basketball with Team Ontario helping her team win a Bronze medal. Kendra plays Striker and Midfield. Kendra will be entering the Cabinetry and Woodworking Technology program. Following completion of this program Kendra plans to pursue her Red Seal as a Cabinetmaker. Due to exams and holidays RRC Recreation Services will operate under reduced hours for December. Please note the following schedule for the North Gym and Loft, South Gym and the EDC Fitness Facility. December 27-31— 8:00 am to 4:00 pm. Busy weekend for all 6 Rebels teams, competing both at home and in across the border in North Dakota. This ten session course will feature all of our great instructors! You will be able to try a wide array of fitness classes within the term, everything from yoga to spin class to boot camp! Along with this great variety, the class will be free to all students! A great way to experience a variety of fitness options here at RRC. Staff are also welcome to attend Feature Friday’s, for $70 they can attend all 10 classes. Classes are held at noon. 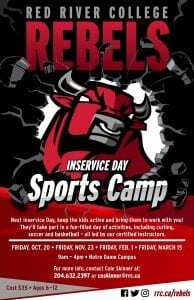 Rebels Inservice Day Sports Camps! 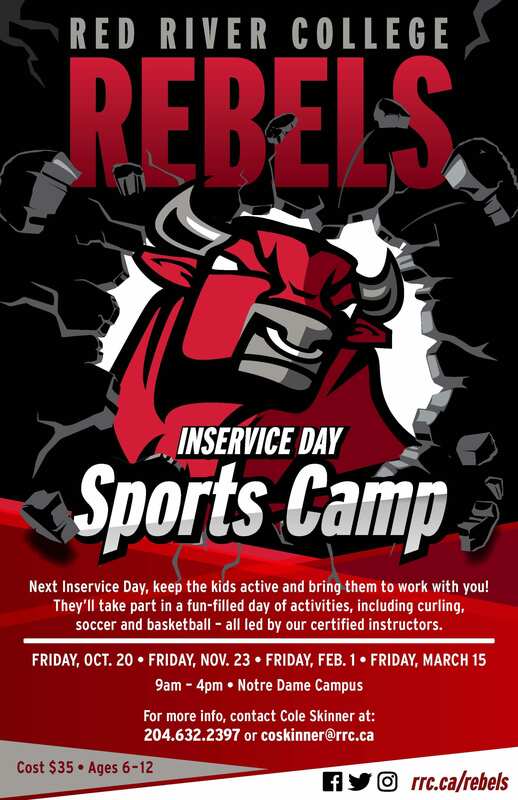 Recreation Services is excited to bring back the Rebels Inservice Sports Camps for another year! Next school inservice day, keep the kids active and bring them to work with you. While you work, they’ll be taking part in a fun-filled day of sports activities! In addition to curling and soccer, kids will stay happy and engaged by playing other sports like basketball and ultimate, low-organized games and participating in other fun activities. Note: children must be 6-11 years old on December 31, 2015. Full refund will be granted if you cancel seven days before the day of class. No refund will be granted if cancellation occurs after the seven days with the exception due to medical reasons (requires a doctors note). For more information please contact Cole Skinner at 204.632.2397 or coskinner@rrc.ca.